Zumwalt-class destroyer USS Michael Monsoor (DDG 1001) held a change of command ceremony aboard ship, March 4, welcoming the crew’s second commanding officer after the ship was commissioned in January. SAN DIEGO (Jan. 26, 2019) Former members of SEAL Team Three join the ship's crew to bring the Navy's newest Zumwalt-class destroyer, USS Michael Monsoor (DDG 1001), to life during its commissioning ceremony. 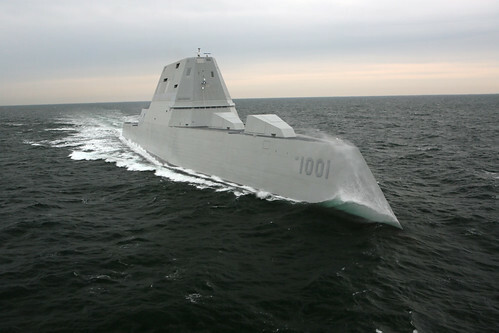 SAN DIEGO – The Navy’s newest Zumwalt-class destroyer, the future USS Michael Monsoor (DDG 1001), will be commissioned at 10:00 a.m. on Saturday, Jan. 26 at Naval Air Station North Island. This event is open to the public, but tickets are required. Sailors from the Zumwalt-class guided-missile destroyer Pre-Commissioning Unit Michael Monsoor successfully completed crew certification phase two prior to departing Bath Iron Works (BIW) in Bath, Maine Nov. 9, certifying the crew ready for sea. BATH, Maine (NNS) -- The Navy accepted hull, mechanical and electrical (HM&E) delivery of the future USS Michael Monsoor (DDG 1001) from shipbuilder General Dynamics Bath Iron Works (BIW) April 24.